Brandon was watching Peyton when I got home with his dinner. They got his order wrong so he didn't get a full meal but he'll survive. I took over watching Peyton, she had been fussing a bit before I arrived. I took her out back to take some photos and she had good fun. After shooting this photo, I let her splash her feet in the pool until her Mom arrived to pick her up. Kayla and I shared about our days for a bit, Kayla caught me up on what is going on with the house they are buying and then she had to take off with Peyton. Brandon took off with Briana and I am left all alone until Robin gets off work late tonight. I haven't seen Jennifer for a while, I miss you Jen and hope things are well. Your father LOVES you! Swing by soon when you have time to chat and maybe I could get a good shot of you to post as my photo of the day. My pop called from Australia, they arrived safely and he was having trouble getting into his mail. Dad, I hope you got in okay... Take care and email us soon. Darling! The B&W, with selective color was a great choice! Love the comp, also! I assume you're a new DP member? It's a wonderful community! Beautiful shot. 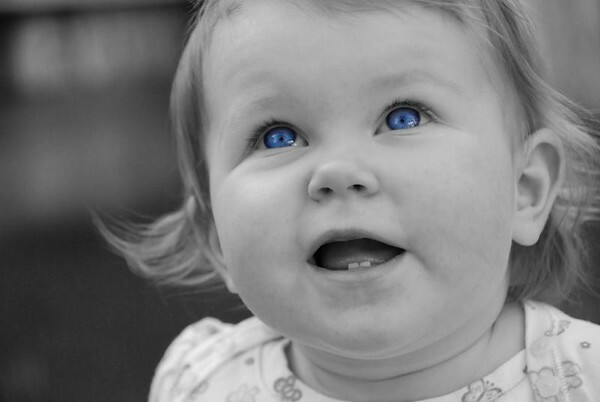 I love the selective color effect to show off her beautiful eyes. I am not familiar with your work. Welcome to the dailies. As 300m said, please link to our community so we can see more of your work easily! Nice Gallery Darron. This is a great shot of the girl with just the eyes in color. Love the look in her eyes. You should link your gallery to the daily photo site for others to see.